Fall marks the beginning of sugar cookie season for me. Yup, that's right! I can not experience the month of October (Nov, Dec, or Feb) without a home made sugar cookie...preferably with sprinkles on top please. This "season" starts in October and ends with the holiday, Valentines Day! What can I say, I love sugar cookies and I love decorating them during the given holiday. I'm always looking for ideas. I find a lot of ideas from cooking ads in magazines and when I see them, I rip them out and stick them in my personal recipe binder so I will always have them. I personally am not that picky with my sugar cookies other than they have to be soft and I prefer home made frosting (ok so maybe I am picky). But when it comes to decorating I really am not picky or real fancy either. I usually make the frosting a fun color and use my creativity with different kinds of sprinkles/candies...that's it. I see lots of fancy decorated cookies around but lets be honest they may look good but the frosting rarely ever is. I would show you a picture of my Halloween sugar cookies this year but...I already ate them....oops. 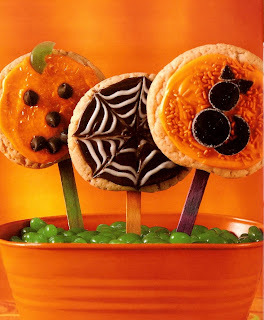 Here are some great Halloween/Fall ideas I've come across that are kid involvement friendly. Children love sprinkling on the sprinkles or sticking on a candy corn or two.